Nicki Howell started her professional writing career in 2002, specializing in areas such as health, fitness and personal finance. She has been published at health care websites, such as HealthTree, and is a ghostwriter for a variety of small health care organizations. She earned a Bachelor of Science in business administration from Portland State University. I Have a High Metabolism, How Can I Gain Weight? If you’re eating right and working out but are not losing weight, it’s time to adjust your routine. Changing the type of physical activity and frequency of your workouts can promote faster calorie burning. Evaluating your diet and looking for opportunities for improvement also promote weight loss. Talk with your doctor to rule out medical reasons you might have difficulty losing weight. If you aren’t losing weight, examine your workout intensity. Moderate levels of activity burn fewer calories than vigorous activities. For example, walking 3 mph burns 317 calories an hour. 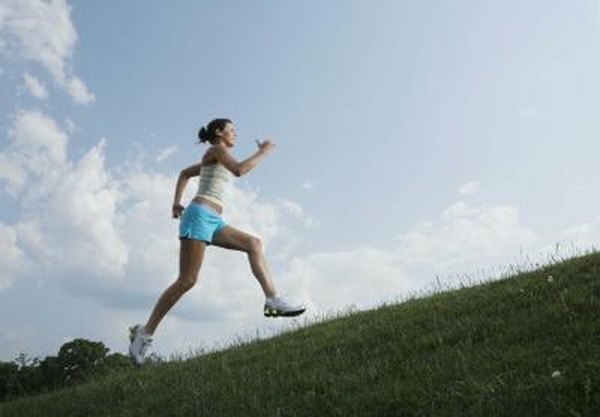 However, increasing your pace to jogging sheds 509 calories an hour for a 160-pound person, according to Health Status. Other vigorous types of activity include rowing, riding a stationary bike, running, cross-country skiing and rollerblading; these burn more than 500 calories an hour. Talk with your doctor about a suitable physical activity level for your situation. Losing weight requires consistent exercise. Aim to complete 30 or more minutes of cardiovascular exercise most days of the week. Don’t forget to strength train. Strength training creates firm muscles. And, after your workout has ended, your body continues to burn higher levels of calories throughout the day. Aim to complete two to three strength-training workouts weekly. Always leave a day of rest between sessions, giving muscles time to repair. Eat a diet that is low in calories and high in nutrients, including lean sources of protein, vegetables, fruits and low-fat dairy products. Consume a serving of salmon twice weekly. Salmon is high in omega-3 fatty acids, which improves your metabolism’s performance, according to “Fitness” magazine. If you don’t enjoy eating fish, walnuts and flaxseed are other omega-3 options. Eat foods that can make your workouts more productive, such as leafy greens and berries. Those foods contain fiber, which promotes better muscle contractions that help flush the food from your system, "Fitness" reports. Soy products are another weight-loss-promoting food; dieters who consume soy milk typically lose more weight than those who drink traditional milk. If you’re working out and eating a low-calorie diet but are still not losing weight, examine your portion sizes. Eating too much of any food, even healthy foods, results in weight gain. Your body stores the excess calories as fat. Read food labels carefully, and measure your portion sizes to prevent eating extra calories. Another method for controlling portions is visual cues. For example, for a cup serving, eat an amount the size of your fist. A serving of protein is the size of the palm of your hand. Eat a serving of peanut butter the size of a table tennis ball. An ounce of cheese is about the size of your thumb. Using these visual cues helps you monitor calorie consumption more easily.